First for Locks locksmith in East Grinstead is a company that believes customer service always comes first. Our aim is to provide a high level of service at an affordable price. 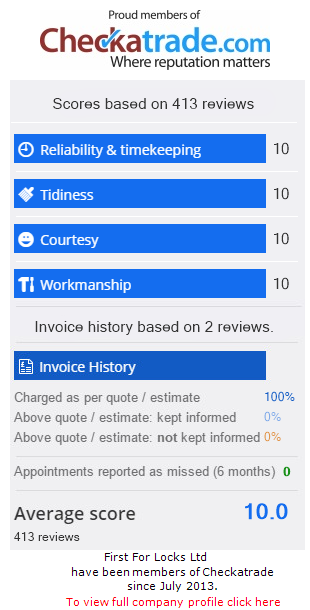 We are proud members of CheckaTrade and take great pride in the feedback we receive from our East Grinstead customers. In addition all our locksmiths undergo a DBS (Police) check and carry an identification card. We offer a fast response, NO CALL OUT CHARGE, 24 hour emergency locksmith service. We are a company who provide genuinely LOCAL East Grinstead locksmith services to our customers. We cover all aspects of work from gaining entry when you are locked out, to replacement locks and repairs after burglaries. We also cover general insurance checks including lock and security assessments. Whether you are a commercial or residential premises, we understand that your safety comes first. If you are locked out of your house or work premises, have had a break-in or have any other security problem, no matter what time of day or night you can call us on 01342 773450 and we promise a member of our team will be with you as soon as possible. Does your East Grinstead shop need extra security to deter vandals or burglars? Would you like to be able to guard your premises 24 hours a day?